EAT (out) – Page 2 – Go There. Try That. One of my coworkers has great taste in films, books, and restaurants. She doesn’t overly suggest so when she does, I move swiftly. This time her recommendation was The Baker’s Table, an almost brand new restaurant in Newport, KY. So how much do I trust Sherry’s taste? I went for breakfast the very next day after she suggested it. And once again, she didn’t lead me astray. Who wants to join me at The Baker’s Table? The Baker’s Table is right for so many reasons. The restaurant is warm, welcoming, and beautifully decorated with cultivated antiques. It’s a bakery, restaurant, and coffee bar in one. This a place you can go by yourself and enjoy a warm cup of coffee, meet a friend for brunch and chat away, or gather around the large baker’s table with your people. Cornmeal Pancakes with Baked Apples. We began our meal with Ricotta Doughnuts. Yep, you heard that right. Doughnuts. Sugary on the outside. Warm and soft on the inside. Paired with a chilled pear-ginger butter = perfection. The child in me really wanted to order more, but the adult in me resisted. But, it’s these details that make The Baker’s Table extra special. The cornmeal pancakes are topped with baked apples, Chantilly cream, and maple syrup. It’s simple, yet special. I love that The Baker’s Table focuses on locally sourced ingredients and that the menu changes with the seasons. My Egg Sandwich was served on a cheddar scallion biscuit (divine) with pickled red onion, spicy aioli, a fried egg, and bacon. My husband ordered the Fried Chicken Sammy (also served on a homemade biscuit). The fried chicken is topped with spicy slaw, hot sauce, and honey! Next time I visit, which will be soon, I’m getting the Egg in-a-whole, the French Toast, and the Sourdough Grilled Cheese. OK. Maybe I can’t get all that at one time. Can I? P.S.- I grabbed a Salted Chocolate Chip Cookie for the road. Again, The Baker’s Table bakes it up just right! GO THERE (Baker’s Table)! TRY THAT (Ricotta doughnuts, Biscuit Sammys)! I love it when passionate people sell me, quite passionately, a restaurant. 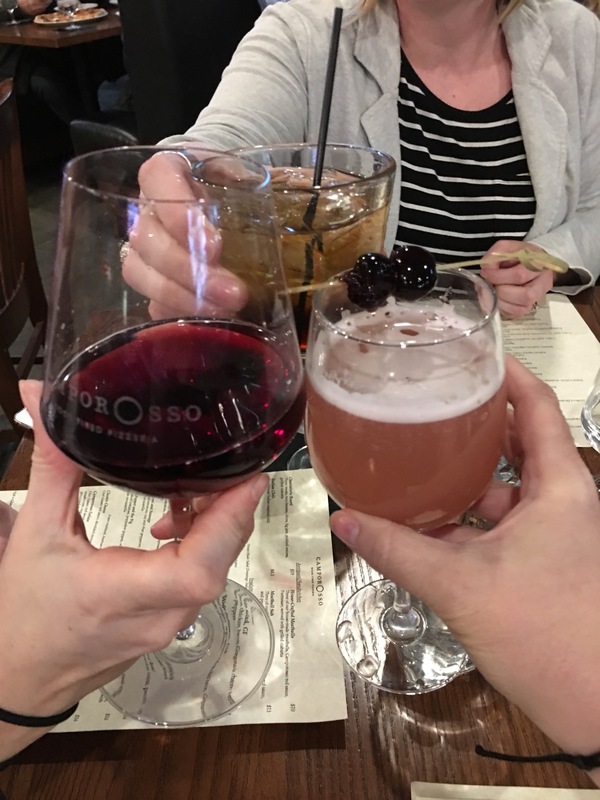 This is what happened with Camporosso in Ft. Mitchell, KY. A friend of a friend, raved about Camporosso; in fact, she was quite surprised I had neither been nor heard of it. I could tell from her sales pitch, I needed to rectify that situation as quickly as possible because if I loved it half as much as she did, I’d have new favorite pizza place! Since then, I’ve been a few times. While Camporosso isn’t brand new, it’s less than two years old, and in the restaurant business, that’s young. I love a weeknight dinner with friends! It took all of about five minutes for my personal love affair to commence. The waiter, without me asking, offered to whip up a mocktail for this nondrinker! What?! Yep . . . smitten. Cheers to old friends and new friends! Cheers to red wine, bourbon cocktails, and fruity mocktails! 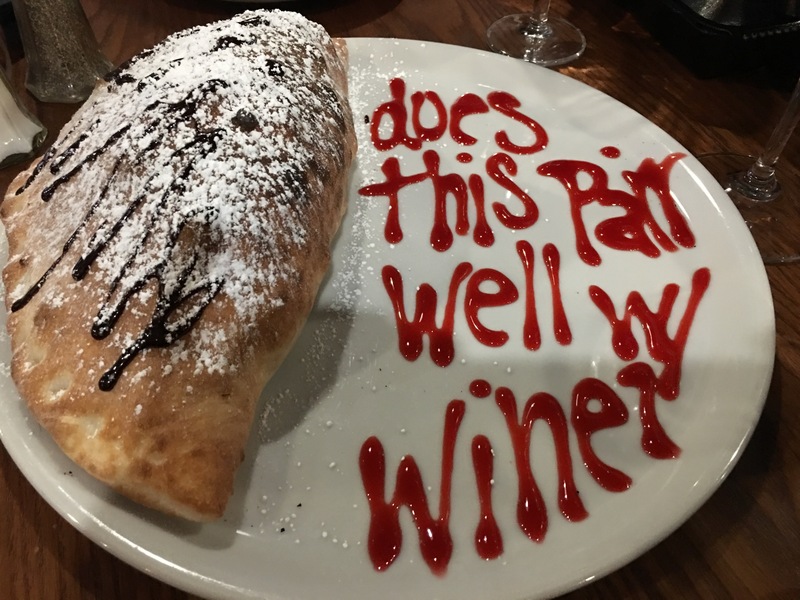 Cheers to the start of a great meal! 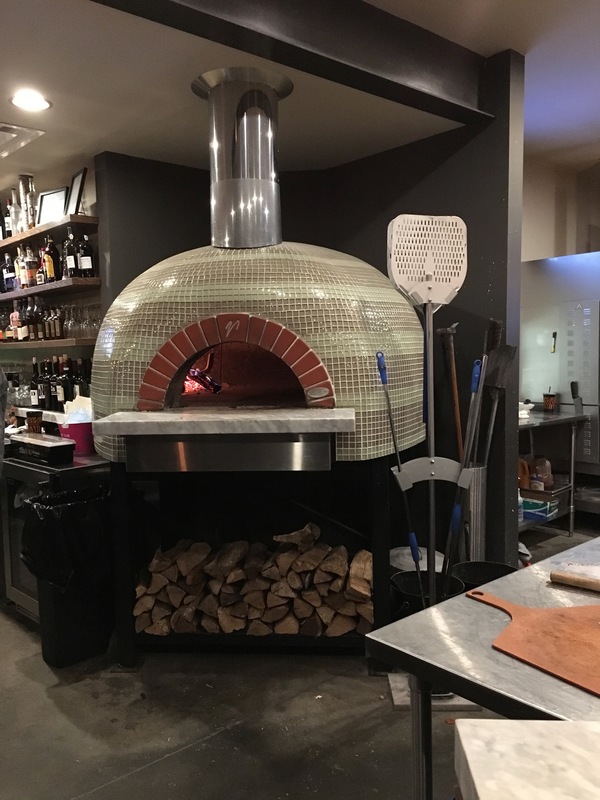 Wood-fired oven imported from Italy! I am by no means an expert in wood-fired or Neapolitan pizza, but I do know what tastes good and I do know this pizza exceeded my expectations. The ingredients are fresh, the crust is crispy and doughy in all the right places, and the pizzas are simple, yet artisan. My friend Korie went super traditional with the Margherita because she just finished watching a special on Neapolitan pizza and evidently, the Margherita pizza is THE classic way to go (san marzaon tomatoes and all)! She was not disappointed. 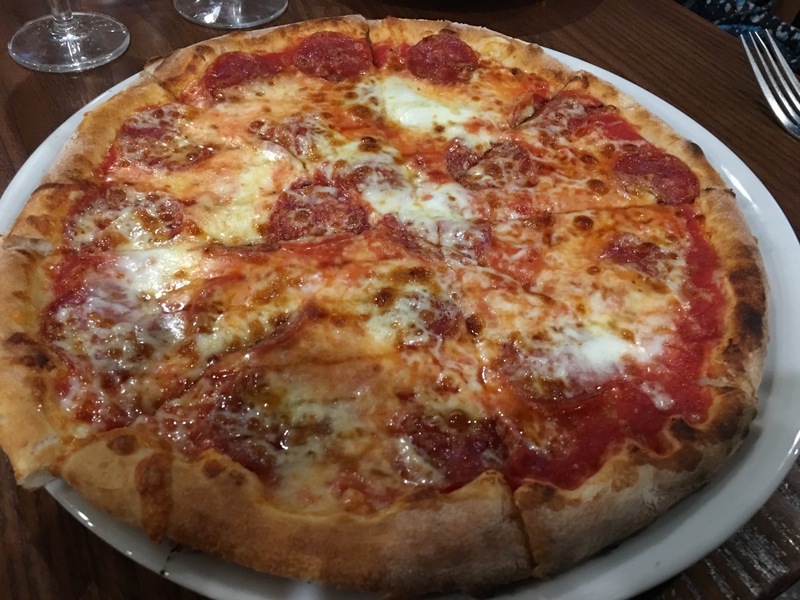 I crushed the Sopressata; the hot honey added a touch of sweet to the crust and I could not get enough. In a second visit, I ordered The Pepper & The Pig (crushed tomatoes, peppadew peppers, wild boar salami, mozzarella) and loved it! I’m so glad because I really wanted to try it as well as the Prosciutto & Fig (prosciutto, fig jam, gorgonzola, arugula). If you begin a meal with drinks, there is an unspoken rule which states that you must conclude with dessert. I’m sure I read that somewhere. 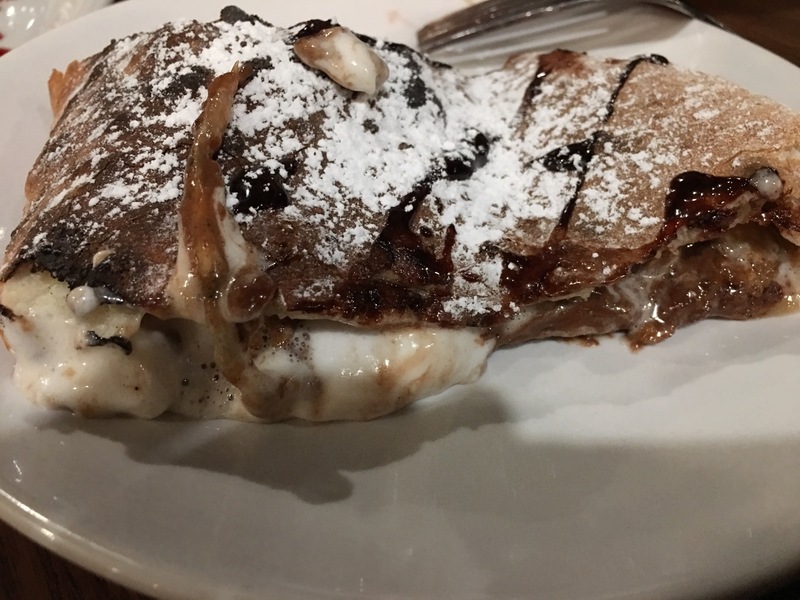 We decided to share the S’more Calzone. This was so rich it was wrong. Wrong in all the sweet, gooey, messy, amazing ways that a S’more should be! OK. So I also tried the Bailey’s Cookies and Cream gelato, too! Yum! Clearly, I’m in love and I cannot wait to go back again! The environment is lovely, the staff is friendly, and when the weather is warmer, the outdoor patio will be ready for me! GO THERE (Camporosso)! TRY THAT (Wood Fired Pizza)!